From Virginia Woolf's heart-breaking suicide letter to Queen Elizabeth II's recipe for drop scones sent to President Eisenhower; from the first recorded use of the expression 'OMG' in a letter to Winston Churchill to Gandhi's appeal for calm to Hitler; and from Iggy Pop's beautiful letter of advice to a troubled young fan to Leonardo da Vinci's remarkable job-application letter, Letters of Note is a celebration of the power of written correspondence which captures the humour, sadness and brilliance that make up all of our lives. Zelda Fitzgerald, Iggy Pop, Fidel Castro, Leonardo da Vinci, Bill Hicks, Anais Nin, Fyodor Dostoevsky, Amelia Earhart, Charles Darwin, Roald Dahl, Albert Einstein, Elvis Presley, Dorothy Parker, John F. Kennedy, Groucho Marx, Charles Dickens, Katharine Hepburn, Kurt Vonnegut, Mick Jagger, Steve Martin, Emily Dickinson and many more. I bought this book as Christmas present for a friend and thought it was beautiful and so interesting and unusual. My friend was delighted with it. I am going to buy another one for another friend. This was bought to give as a Christmas present. My friend has phoned me to say the book is lovely to handle and is full of a variety of fascinating correspondence. Two examples - from Gandhi to Hitler in 1939, the last message from the Titanic. 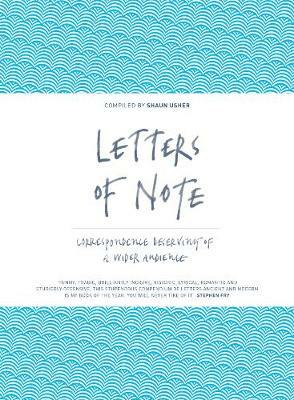 More recently I have loved the letters on Shaun Usher’s website (www.lettersofnote.com) and was delighted to see it come out as a gorgeous book featuring letters in their original form. There are over a hundred of the world's most entertaining, inspiring and unusual letters. Some sad, some hilarious, some weird.